And so it resumes. Now that we are home from our driving trip, we are back on the RV search. To start things off, we went to a “dealer” show in Fountain Valley, California. 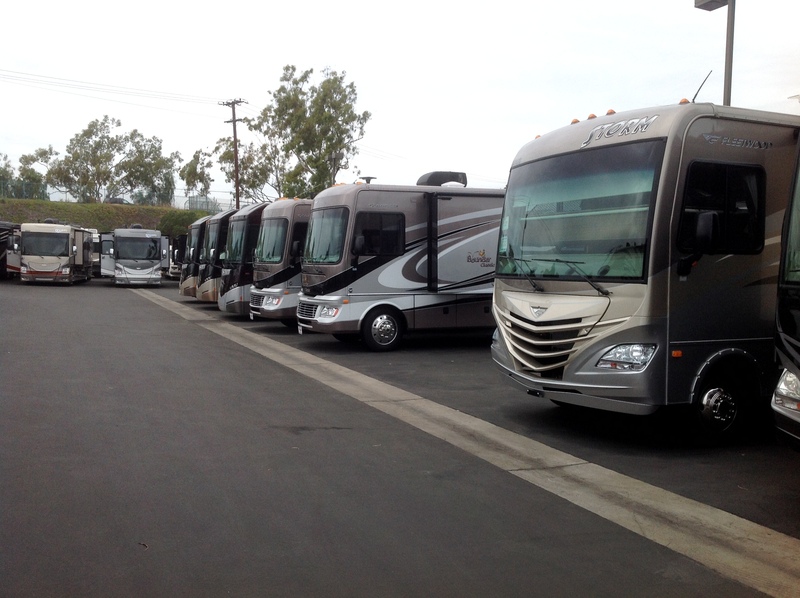 It was put on by the largest RV dealer in Southern California, a dealer that we haven’t had the best experience with in the past. These guys can be really pushy, as I mentioned in an earlier post…..we were subject to high pressure sales at their location in Santa Fe Springs, followed by the third degree from a sales manager as we were trying to leave, and then frequent phone calls for weeks afterward. This really soured me on the company. I must say that I was very pleased with this show at the Fountain Valley location. 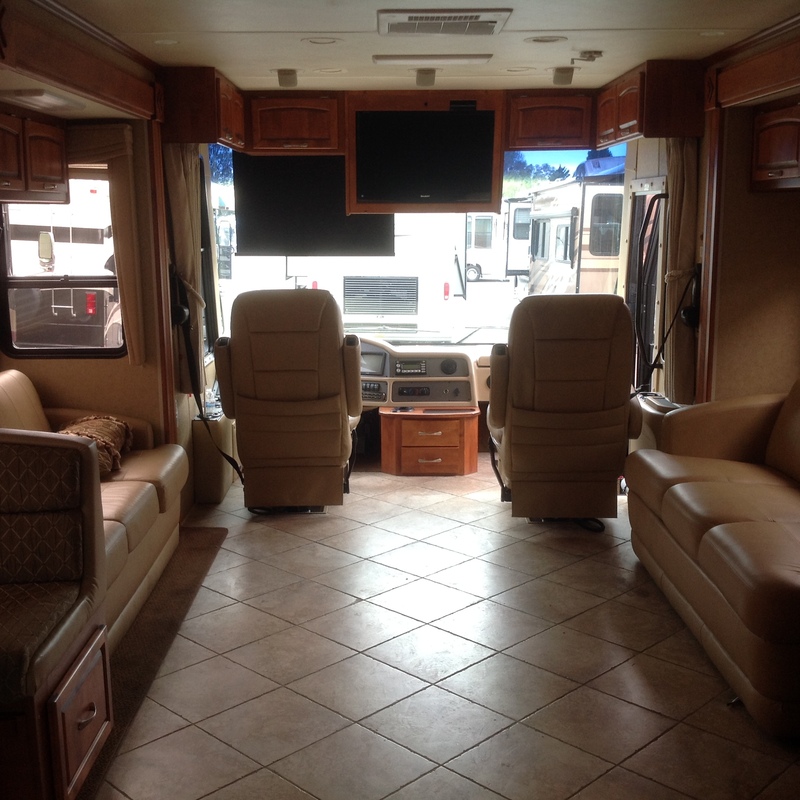 We walked onto the lot, got a welcome from the girl at the front desk, and then were allowed to wander through a large number of new and used motor homes at our own pace and without any harassment by sales people. We talked to the yard manager briefly at one point, and he was friendly and helpful. Perhaps it’s well worth the extra 15 minutes to drive past the Santa Fe location and go to Fountain Valley instead. 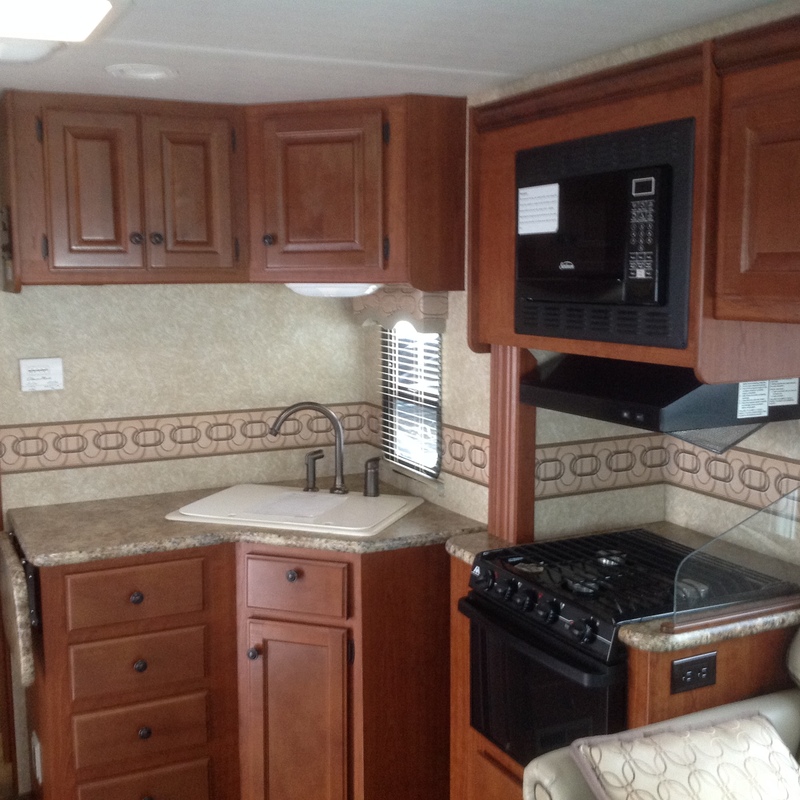 Since we are focusing on Class A motor homes, that is all that we looked at. The new coaches were up front, so we went through those first. Early in our days of RV shopping, we were quite taken by the entry level Class A/C “hybrids” like the A.C.E. by Thor and the FR3 by Forest River, as well as the entry level Winnebago Vista 26HE, the Coachmen 29, and the Fleetwood Storm. A/C Hybrids have drop down beds in the front, which is supposed to make them like a Class C with the over-the-cab bunk. Most of the coaches in this niche are between 26 and 30 feet long, on the small Ford V10 chassis – 16,000 to 18,000 GVWR. This puts them between the Class C and Class A from a size standpoint. 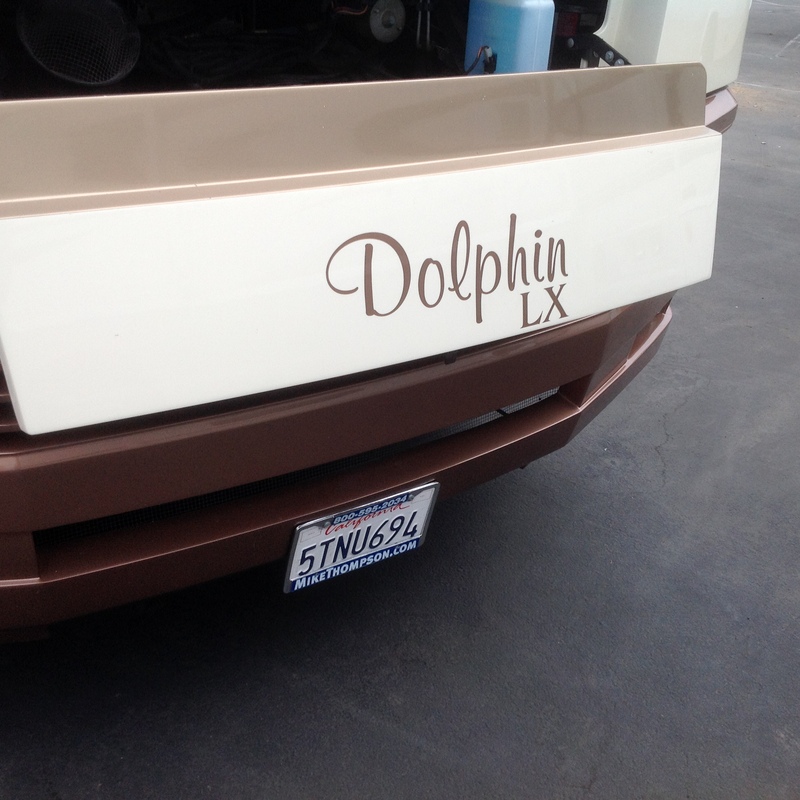 Wheelbases are on the short side….an example would be the 30 ft version of the A.C.E. at 190 inches. My favorite of all of these, from a floor plan and features standpoint, was the FR3. Before Laura and I did a lot of research on RVs, we could see ourselves in an FR3. This coach is basically a rip off of the A.C.E. 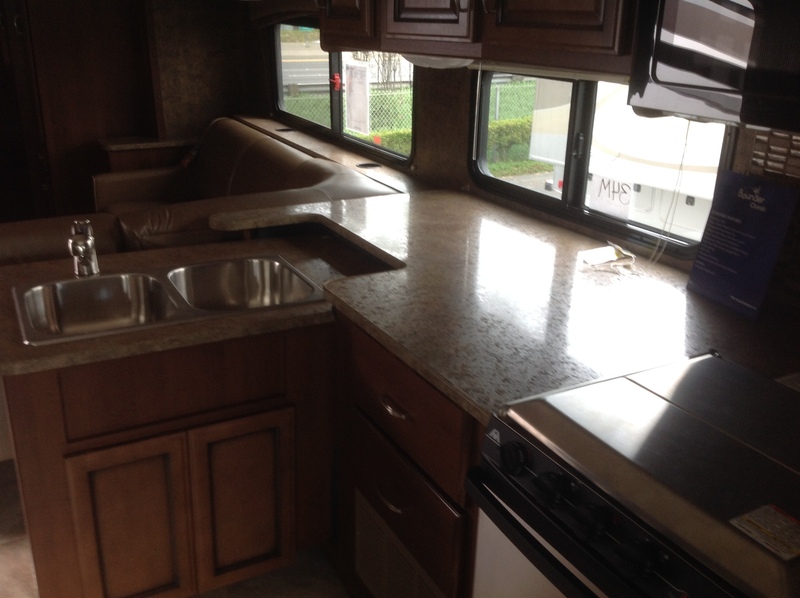 30.1, but the fit and finish look better, and it has some desirable features such as a double sink. Over time, we ended up deciding that we aren’t interested in the entry level A/C Hybrid coaches. In the early days, the thought of driving around a large motor home was scary. Seeing a short motor home like the Winnebago Vista 26HE sitting next to coaches that are 34 feet or more made the small coach look a lot easier to deal with. We’ve changed our mind about that. 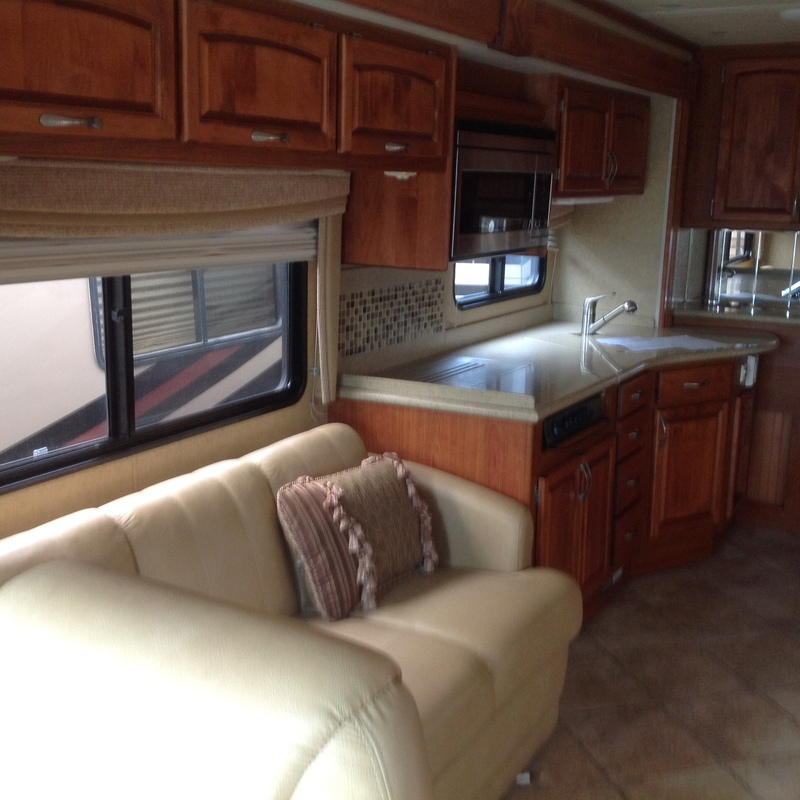 Late last year, we bit the bullet and rented a Class A motor home from El Monte RV. 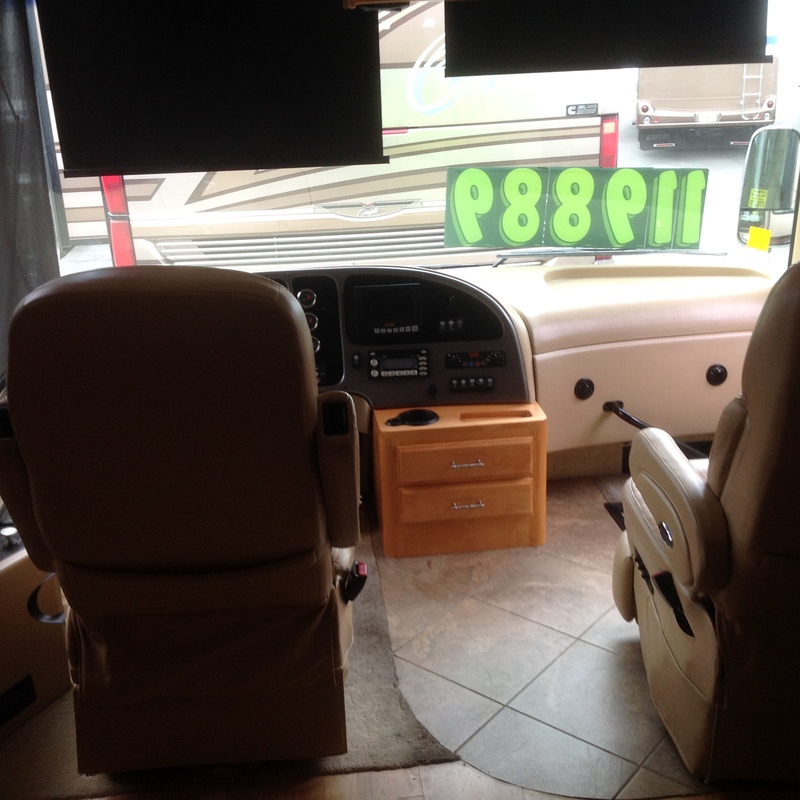 The coach was a 2007 Fleetwood Flair 33R. These units are 34.2 feet long. On the day that we picked up this coach, it looked just enormous to me, and I had a good case of the butterflies as I climbed into the driver’s seat. As it turned out, driving this monster was absolutely no problem at all. I had read several internet articles on driving Class A’s, and watched some good YouTube videos as well, and that was helpful. The rig handled quite well, had plenty of power, and was actually relaxing to drive. Scratch one reason for wanting to stay with the entry level short coach. Just as important was living in the bigger coach for a few days. We really appreciated the size. While a 34.2 foot coach isn’t huge, it’s substantially larger in scale than the entry level hybrid coaches we had spent time in at shows and dealerships. 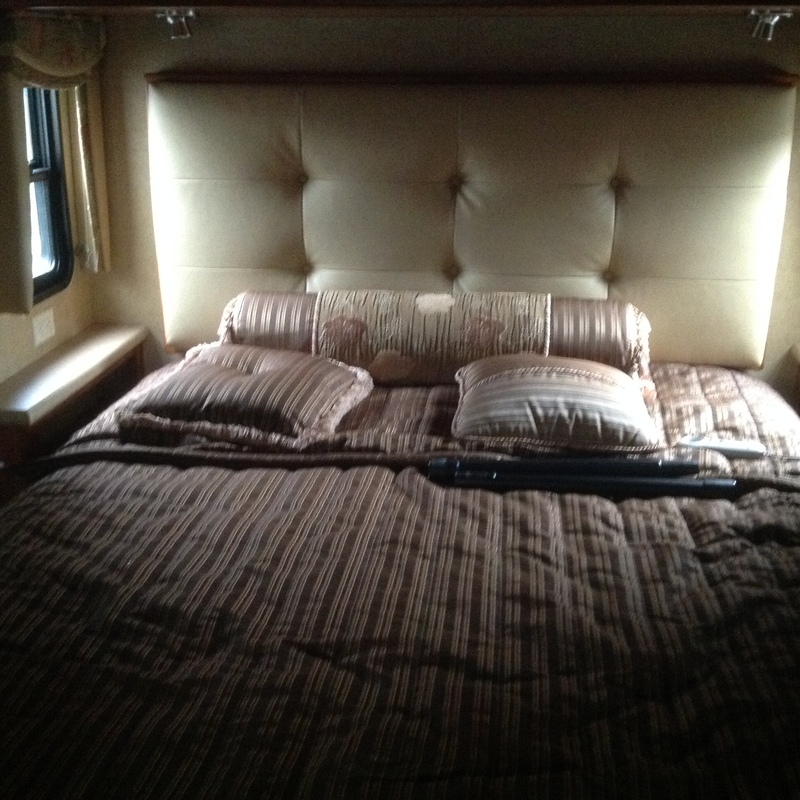 Laura, Izzy, and I had plenty of room to stretch out and enjoy time in the 34 footer. So, driving a larger coach was no problem, and we found that the extra size of a larger coach was really nice. What else led us away from the entry level hybrids? doors that don’t fit, and other problems. 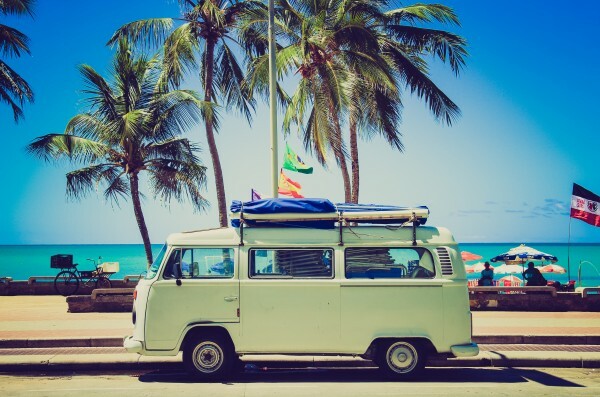 I would say that on average, even including input from the happy owners of these coaches, the perception is that they are only adequate for a couple vacation trips per year plus a few weekend outings here and there. Nobody seems to think these coaches will stand up to frequent long trips, or any kind of heavy duty or full time use. In fact, the owner’s manual for one of these coaches that I saw online states specifically that the unit was not designed for full time use. Now that we have eliminated the entry level coaches, what’s the alternative? At the show, we looked at new units that were a step above entry level in both size and quality, but still not out of range from a price standpoint. The brands they had that were close to our criteria were the Forest River Georgetown line, the Fleetwood Bounder line, and several levels of the Itasca line. Laura and I had a hard time finding a coach that we both liked. The only one that we both really liked a lot was the Georgetown VE 329. 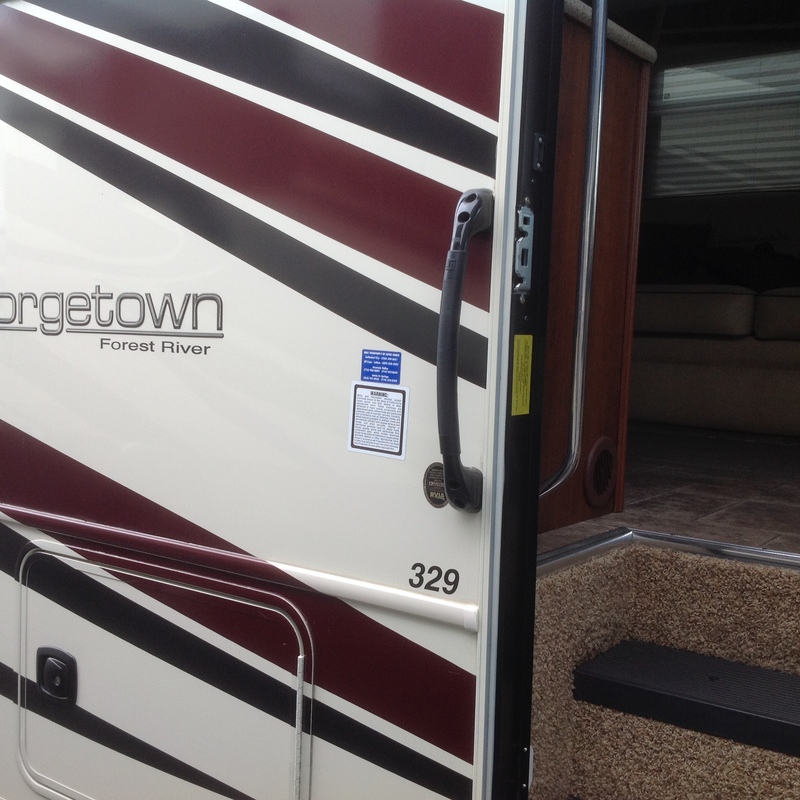 The Georgetown 329 had most of what we want…..a nice wrap around dinette, good-sized couch, Euro Recliner, double sink, and a counter with lots of room to work. It also had the TV in a very usable spot. The bedroom had the queen bed in a slide, with small windows by each side of the head of the bed – good for cross ventilation (this is one of Laura’s favorite features, since she tends to sleep hot). This unit also had the scale that we are looking for which should improve handling on the road. The GVWR is 20,500, and wheelbase is 208 inches. That is really generous compared to the entry level hybrids. We were a little disappointed that there was only one new coach we both liked. There were a couple that I liked but Laura didn’t. One of the Fleetwood Bounders looked good to me, but Laura hated the kitchen counter. She had a point on that one. There was a lot of unusable space on that counter, and it was strange the way they integrated it into the slide. A few words about bunkhouse models. For a while we were thinking that a bunkhouse model would be a good idea. This was mainly my idea. We have a middle aged cat that we would need to take with us for long trips. I don’t want to burden the family with feeding him every day when we’re gone for a couple of months at a time. I could envision removing the mattress on the lower bunk and using it as a place to put a cat box and perhaps other pet supplies. There are a lot of nice bunk house models out there in the 34-35 foot range. 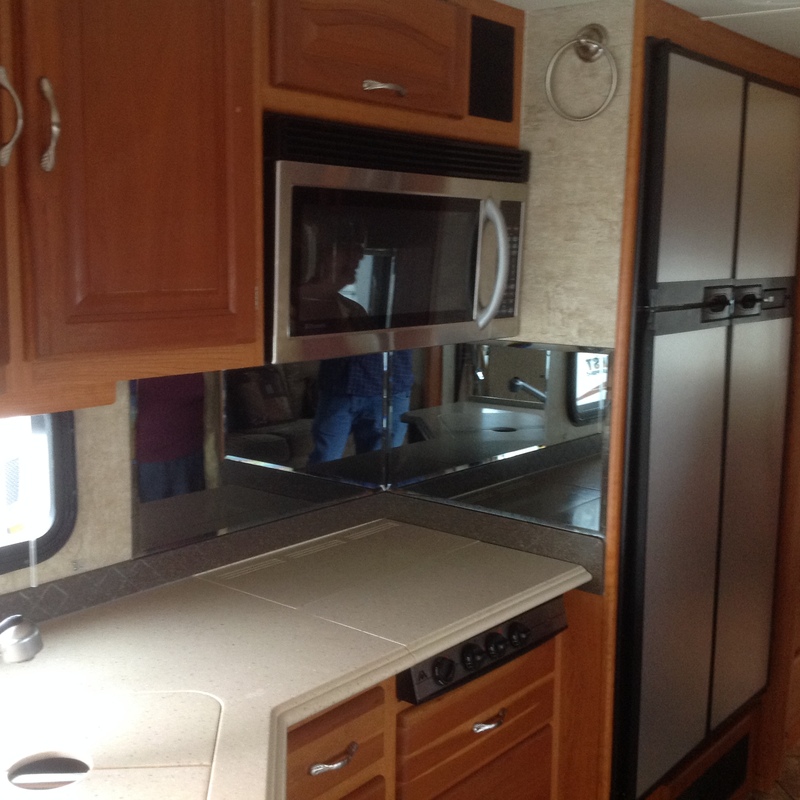 One we liked was the Fleetwood Fiesta 34 footer that El Monte RV sells. These, of course, are former rentals, but they are selling them before they get too many miles on them. We looked at a 2010 model while we were there that had about 60,000 miles on it, for an asking price of about 65K. I think we could have worked that price down into the mid 50K range, based on what I’ve read here and there. We saw a nice Fleetwood Bounder 34B bunkhouse model at the show that was very similar to the Fleetwood Fiesta, but there were things about it that we didn’t like. It was, however, the only other new model that I could have lived with at this show – making a total of three that interested me. I liked it more than Laura did. The problem with bunkhouse models is that you give up too much living space. It’s usually either the extra chair in the salon, or a big piece of counter space. Laura came up with the idea that we could probably put the cat box in the shower, and pull it out when we need to. I have some problems with that idea, but over all it will probably work. She has a good point. At this point, I would say that a bunk model would not be a target for us. If we found a nice one that had other features we also like, perhaps we would reconsider, but at this point this is no longer a focus for us. After only finding one of the new coaches that we agreed on, we decided to look at their used coach inventory. The first one we went into was a Fleetwood Fiesta 32S. This coach didn’t smell very good, and we didn’t like the floor plan. The kitchen counter was way too small. That being said, it wasn’t in terrible shape, and they were asking 49.9K. I suspect somebody could have talked that down a little. 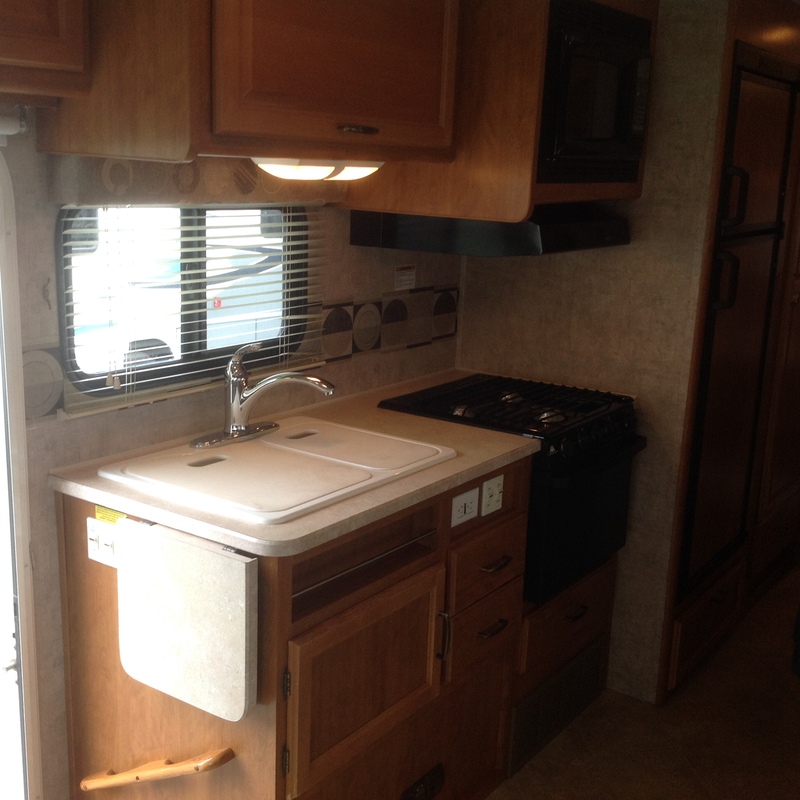 Next up was an Itasca Suncruiser 35 offered at 59.9K. This was a nice coach and it was in pretty good shape too. It had some recent upgrades, such as a new flatscreen TV (looked like about 37 inch) that still had the energy rating sticker on it. There was one huge problem with this coach. It was a 2004. Too old for my taste. And the price was way out of line for a coach that old too, no matter what upgrades had been added. 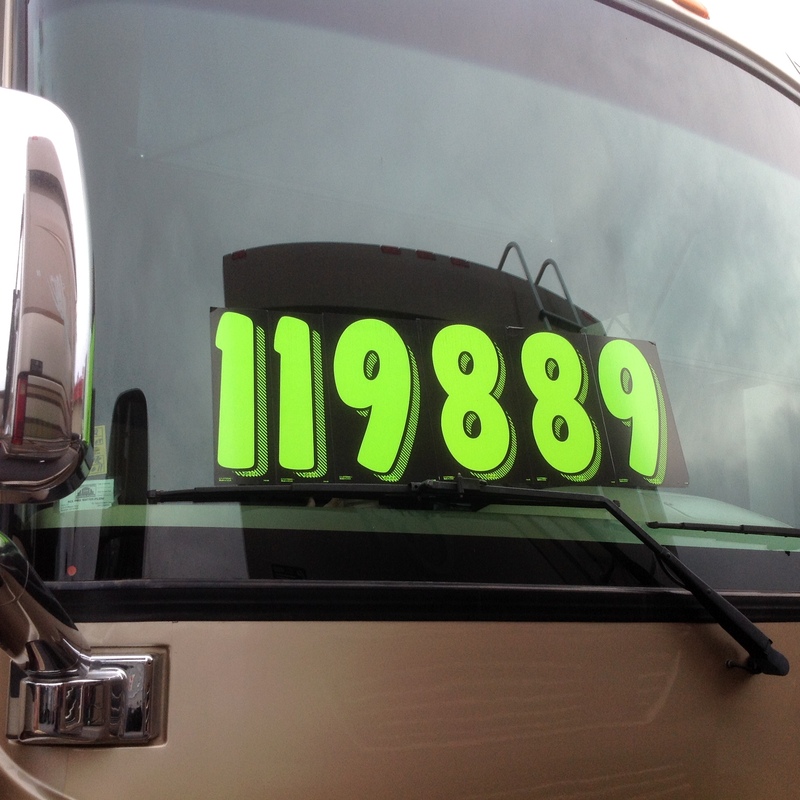 The NADA low retail number for this coach is 40.8K. Enough said. I’m sure these guys would deal a ways down from 59.9K, but seeing a coach priced that far above what it’s worth is a turn off for me. It’s like they are looking for suckers. Next up was a coach from one of my favorite companies, Newmar. I was pretty excited to see this one, until I got close enough to see the year. It was a 2003. Way too old (I don’t think I’d go earlier than about 2009 for a Gas Class A). Then there was the asking price – 49.9K. NADA low retail for this one is 32.2k, so obviously this is way overpriced and needs to be negotiated way down. We went in to look at it anyway. 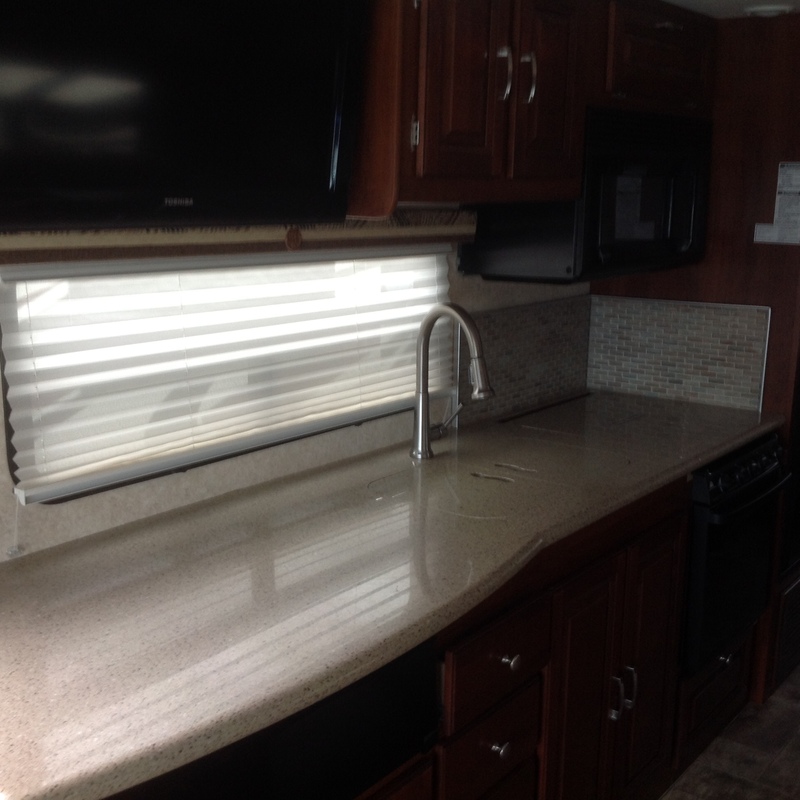 Newmar does a nice job. Look at this shot, and then remember that this is an 11 year old coach! Now on to a newer coach. Windsport is a line of coaches originally from Four Winds. That manufacturer didn’t survive the late 2000s financial melt down. Thor picked them up, and has continued on with many of their most popular models. The Windsport is very much like the Hurricane – in fact, one salesman told me that they are basically identical lines. Since coach models are allocated to dealers based on the nearest competition, having both the Windsport and the Hurricane means they are selling these coaches at two dealers that might be right next to each other. I suspect Itasca and Winnebago coexist for similar reasons. 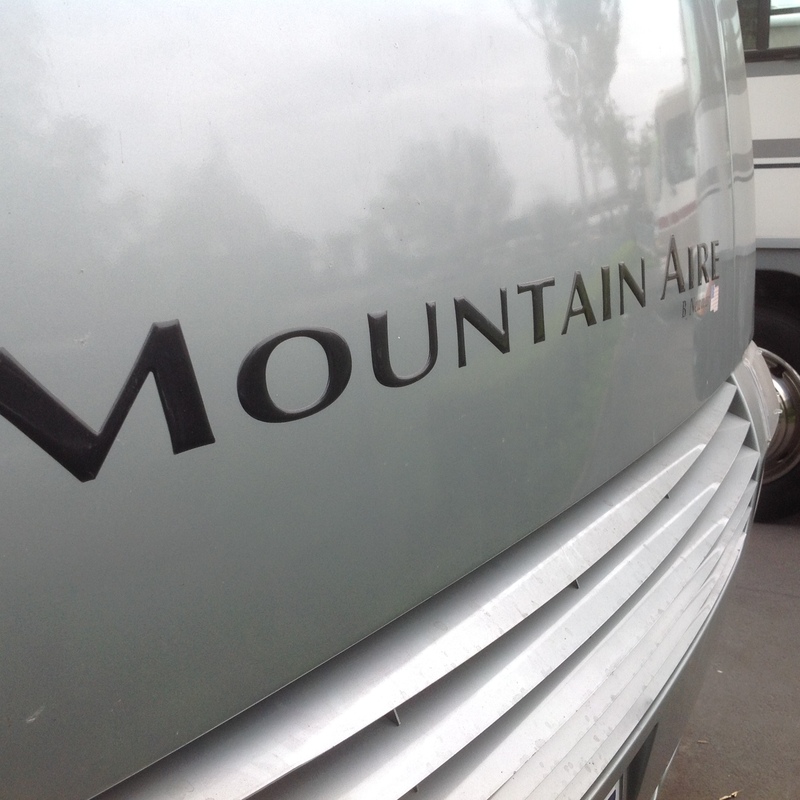 The coach we saw here was a 2011 Windsport 31D. Asking price was 69.9K. That doesn’t seem too bad for a 2011 coach until you look at NADA low retail, which is 59.3K. I see a lot of these 31D models of very recent vintage for sale….more than any other model. I wonder if there are problems with them. This model isn’t one of my favorites. I like some of this line, in particular the Hurricane 32A and the Hurricane 34B, but not this model. Why? 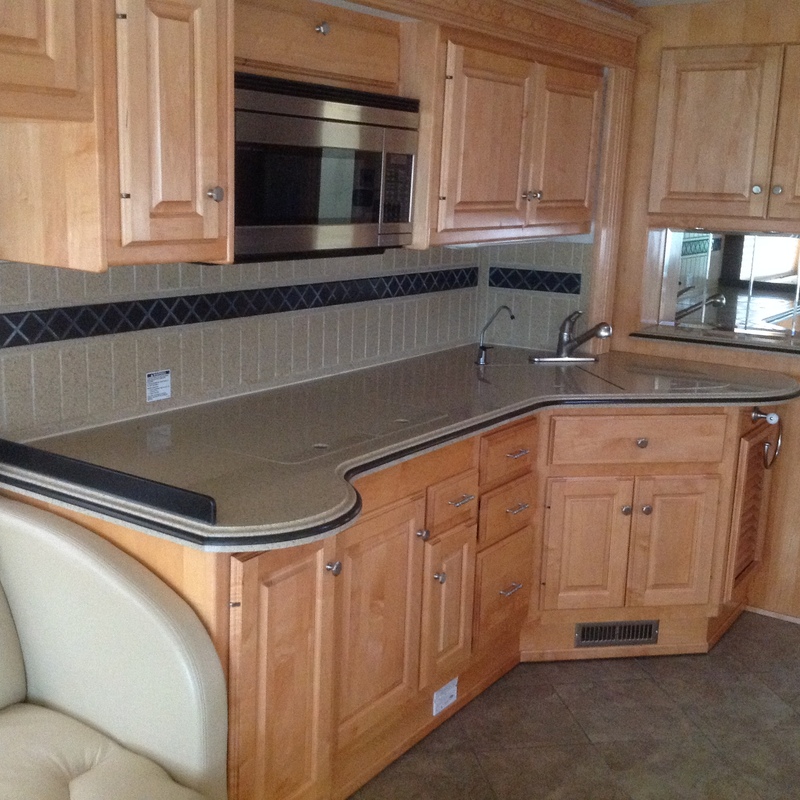 Mainly because of the kitchen which is an L-shape “folded” kitchen – it just doesn’t look very handy to me. 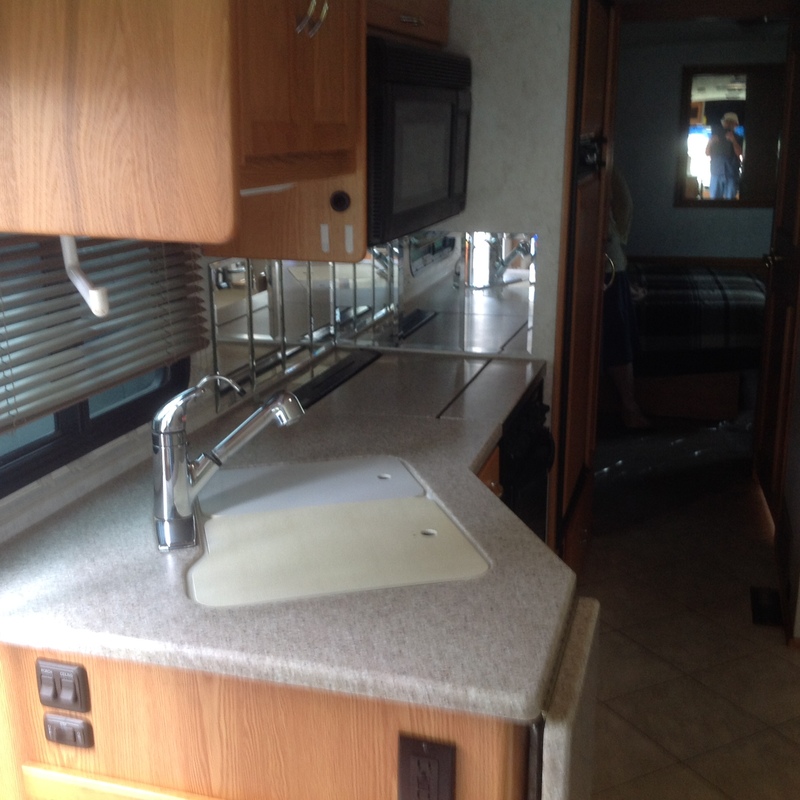 This kitchen configuration is found quite a bit in short coaches from most manufacturers. The last one of this group of coaches was another older coach – a National RV coach called a Dolphin. It was a 2006 model, which was priced at 74.9K. I hesitated to even look at this one. Part of the reason was the age, and part of it was the company. National RV went out of business in 2008. That’s a pretty long time ago. Unlike other manufacturers that went out of business during the downturn, nobody has picked them up. It’s a dead line. That’s a shame, because from what I can tell, these were really well made coaches. 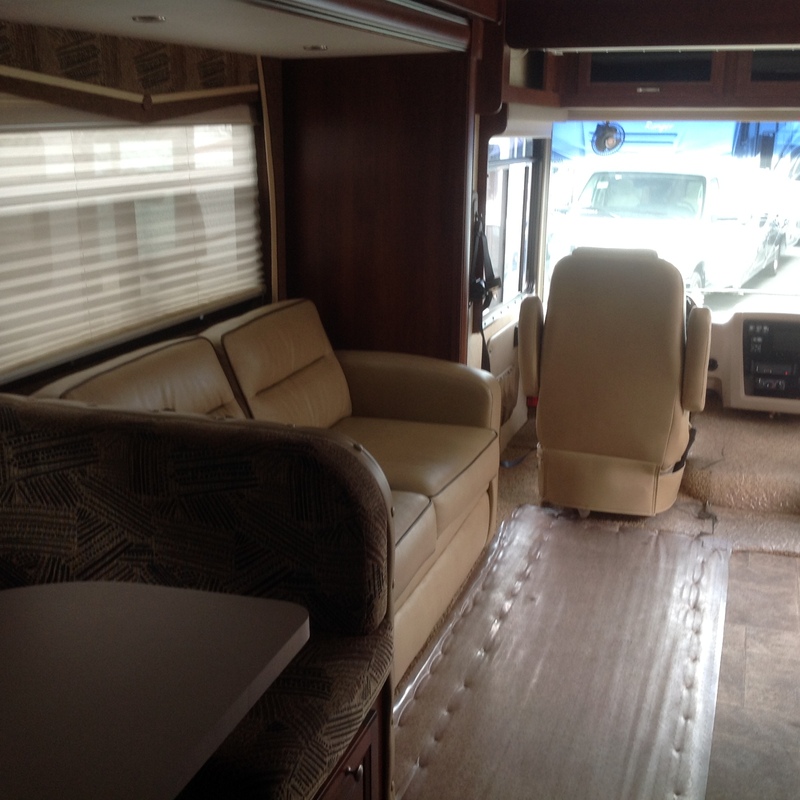 The interior reminds me of a Tiffin or Newmar. I didn’t take a lot of pictures of the inside, and this shot doesn’t really do it justice, but it’s the best that I have. This coach is full of real wood and higher end details. 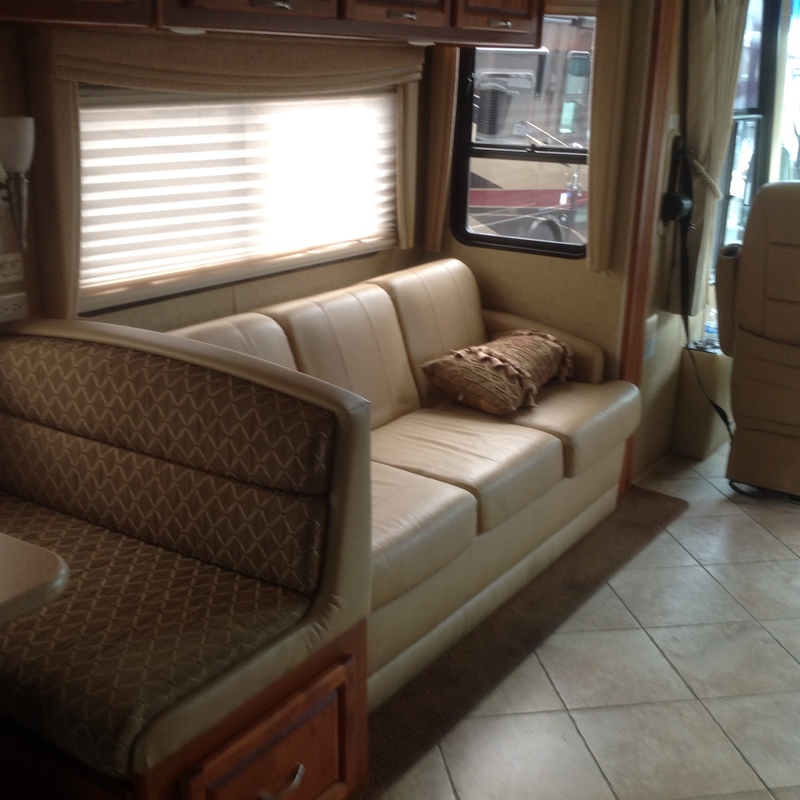 And although asking price is too high – NADA low retail for this one is at 56.2K – it’s not bad for a 2006 coach. Contrast that to the Windsport 31D above which is a 2011 model with a low retail value of 59.3K. An eight year old coach that is worth only 3.1K less than a four year old coach? The difference, of course, is build quality. 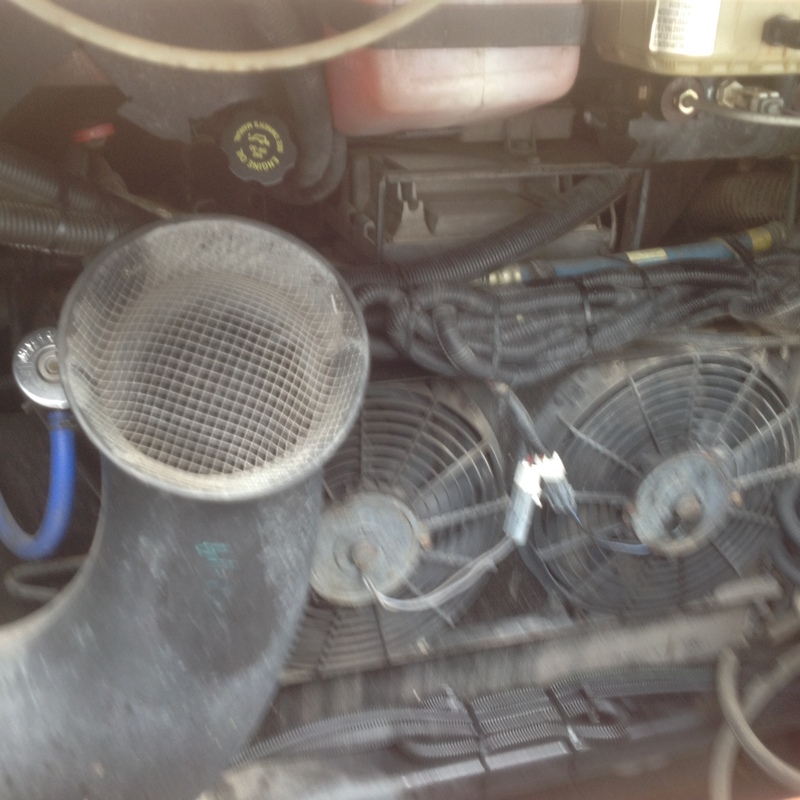 However, to give you a glimpse of what buying a 2006 coach really is……look at the photo below of the engine compartment. I know this doesn’t mean that the engine is shot, but it certainly looks like it’s been around. While we were ambling around the used coaches, we met the Yard Manager. After we told him that we didn’t see any used coaches that we liked, he asked if we’d seen the used diesel pushers (DP) yet. I told him that those would probably be quite a ways above our price range, to which he said “you might be surprised.” That didn’t really convince me, because I know that most DP units cost between 200-300K new. But to be honest, we hadn’t really done much looking at DPs, so we decided to walk through them. 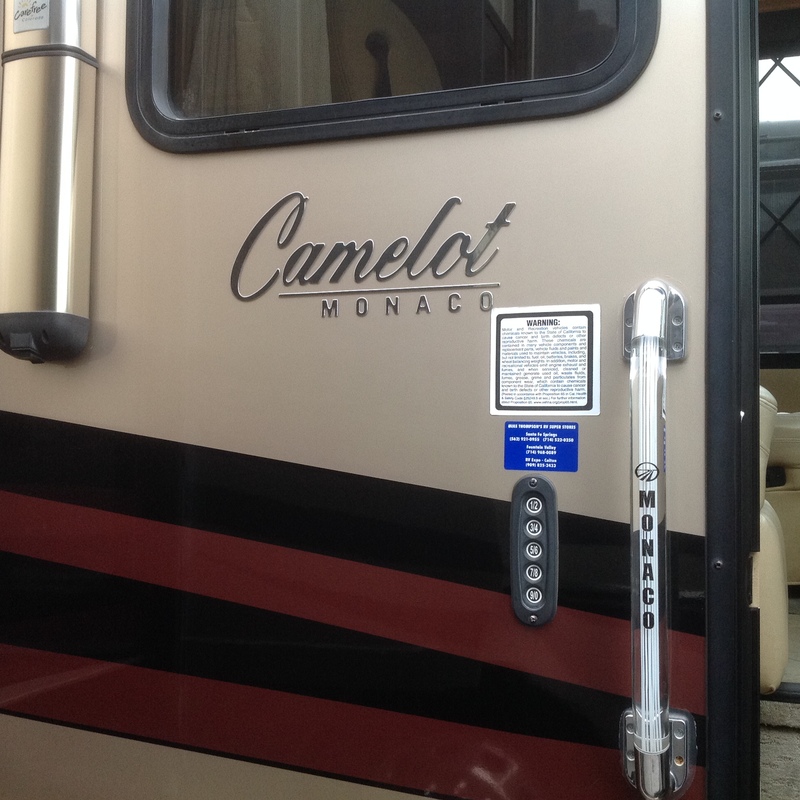 The first one we entered was a 2006 Monaco Camelot 40 PDQ. Asking price above. This was the only coach I had seen so far that wasn’t way above the NADA low retail value on the asking price. The NADA value on this one is 116.9K. MSRP on this sucker was 273.5 when it was new, but I’m sure it sold for a good deal less than that…..20% discounts off of MSRP are the norm. I was pretty impressed with this one. It was obvious that the quality was there. It had wood laminate and tile floors, too. The kitchen was the best I had seen to date. This one had the classic DP front entry (“bus style”) door. Note that the floor in the driving area is flat, and note the tile. So, why was I even bothering to look at this one, given that it was a 2006 model? My age criteria is different for a DP than it is for a gas coach. I would like to stay at 2007 or newer for a DP, but under the right circumstances would consider a 2006. With a gasser, I would only go five model years earlier, or to a 2009 (and if we wait much longer, with 2015 models coming out, I may need to stick to 2010 or newer.) These age limits are partly due to normal wear and tear, and partly because we may need to get some financing and most lenders have significantly tightened up on lending for older coaches. Does that mean that I think a pusher is the way to go for Laura and I? I’m not sure yet. just the sheer size. 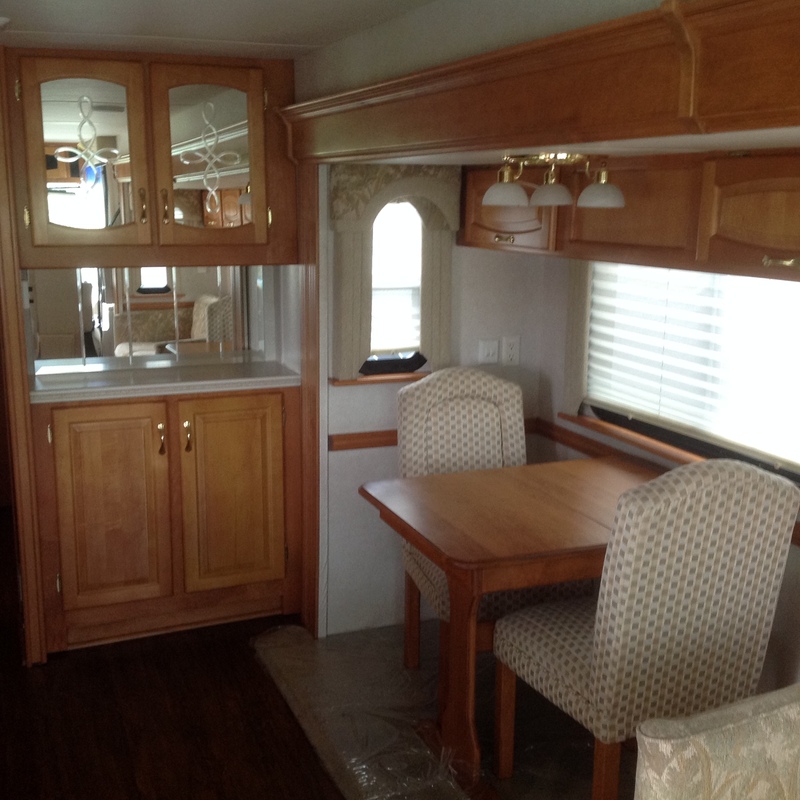 This Camelot is a 40 foot coach. I handled 34 feet just fine, but 40 feet? The positive thing about starting to at least consider this direction is that it opens up a lot more possibilities for used coaches. The Camelot was an expensive coach, really beyond our price range even at the NADA value, but there are a lot of DPs out there with a NADA low retail value in the 80-95K range. That is a little more like it. Part of what makes the Camelot so expensive is the engine, which is a 400 HP unit. There are a lot of 330 to 360 HP units out there, often in 36-38 foot coaches that cost a lot less, but still have the very nice features and finishes. 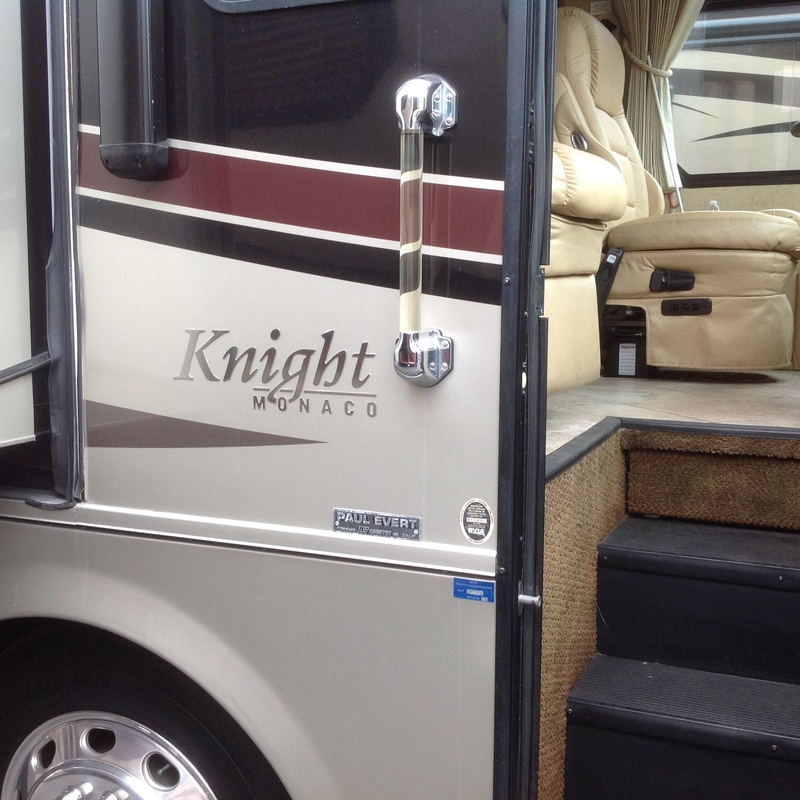 My favorite of the DPs that we looked at, and also my favorite coach of the show, was a 2008 Monaco Knight 38PDQ. Monaco Knight couch and counter. 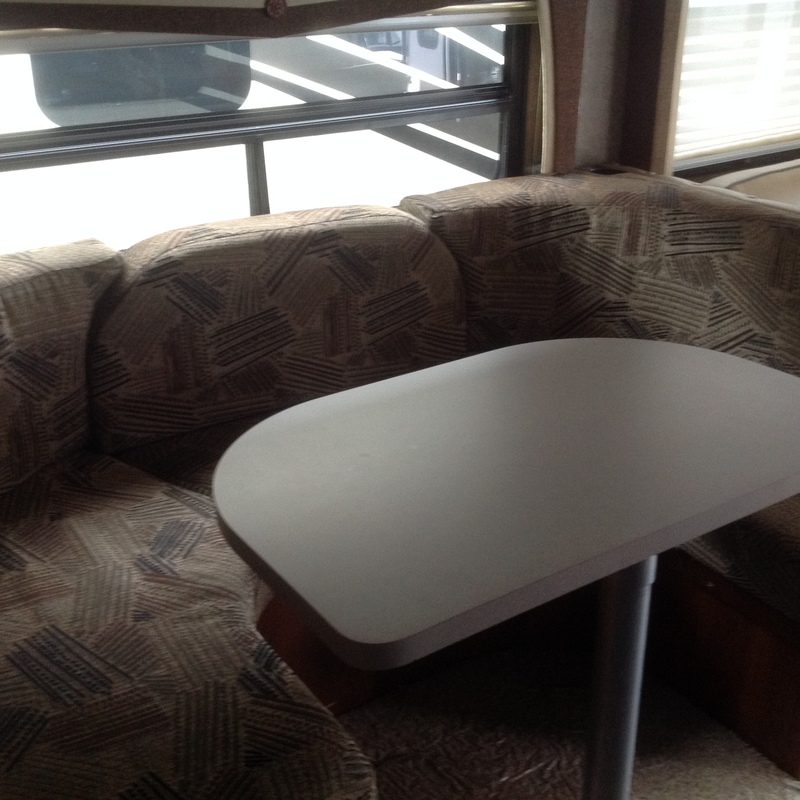 Couch # 2 and Dinette. I think some of the upholstery in this unit needs replacement. That was about it for the show. Where does that leave us in our search? We are narrowing down now. For Gas Coaches, we are going to focus on higher end 32-34 foot units from either Tiffin or Newmar. Price point we are looking at is between the mid 70K and the mid 90K range. We would like to limit to model year 2009 and newer. For DP Coaches, we still need to do more research, but what I’m thinking as of now is 2007 and newer model years, no more than 60K miles, with a price below 100K.